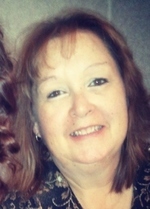 Family and friends surrounded Becky Lynn Rochford Sanchez, when she passed away peacefully on Wednesday, August 1, 2018, at Four Corners Healthcare Center in Durango, Colo. She was 59. Becky died from complications related to cancer and was assisted by Hospice of Mercy. Becky’s family extends heartfelt appreciation to all the caregivers at Mercy Regional Medical and Four Corners Healthcare centers for their devotion to Becky in the last two months of her life. Becky was born to Robert and Virginia (Hickman) Rochford on September 9, 1958, in Denver, Colo. A small child when the family moved to Durango, she attended Riverview Elementary, Miller Junior High, and Durango High School. She was originally in the Class of 1976 at DHS, but she faced numerous obstacles after her father died in 1973. She later returned to Durango High School, officially graduating in 1978. Her family was so proud of her perseverance. Becky was a cowgirl through and through, and she enjoyed attending rodeos, western music, and dancing. Becky, her sister Sheri and her friend Joni Casey, saw two George Strait concerts before he was famous. She and her sister-in-law, Debbie Rochford, became members of the George Strait Fan Club, and “Amarillo by Morning” is a favorite family song. It was apropos that she worked at Western Outfitters, a Durango business owned by her parents Don and Virginia Mertz. Becky helped her mother with many Navajo Trail Fiesta Queen contests and often modeled western wear for these events. She learned the retail business from her parents and in the early 1980s went to work for Norwest Bank. She stayed with the bank through mergers and changes. During her time at what eventually became Wells Fargo Bank in Durango, Colo., she earned numerous awards and accolades for her customer service and loyalty to her customers. Unfortunately, her career at the bank ended on a low note, after she was injured. She and the bank parted ways in a manner Becky and her family continued to feel lacked goodwill. Becky met the love of her life, Jimmy Sanchez, in the mid 1980s. The couple married on August 19, 1989 at Edgemont Ranch. Becky was involved in many community activities through her work at Wells Fargo. She also participated in the Navajo Trail Fiesta, as well as school activities for her daughters. Becky’s life revolved around her husband and two daughters, and they enjoyed a number of fun family vacations, including a cruise to Alaska and a trip to Disneyland. They also enjoyed riding the Cumbres & Toltec Scenic Railroad with Uncle Dan Rhodes and going to the Dominican Republic with her daughters and with her sister and brother-in-law Dan and Sheri Figgs. As a teenager, some of her fondest memories were the pack trips she took with her father and brother up the Pine River near Vallecito. Another favorite activity was visiting her husband when he worked on the television series ‘’Longmire’’ and other movies filmed in New Mexico. Becky enjoyed meeting some of the film industry stars, particularly those who were down-to-earth. At home, Becky loved spending time with her dogs, “B,” Madi and Rocky Bear, who died the day she went into the hospital. Becky is survived by her husband of almost 29 years, Jimmy Sanchez; her two daughters, Micah Sanchez, 27, and Jimi Lynn Sanchez, 25; her father, Donald Mertz; siblings Sheri Rochford Figgs, (Dan), Sonny Rochford (Debbie) and Chandra Huber; her sister-in-law, Rose Raimondi; her brother-in-law, Alfredo Sanchez; and her godson, Reece Rangel. Numerous aunts, uncles, cousins, nieces, and nephews also survive Becky. She loved them all with zest and a feisty sense of humor. In addition to her father, Robert Rochford, her mother, Virginia Mertz, her brother-in-law Roland Huber and her Aunt Jean Rhodes preceded Becky in death. Tom McCarthy, Ray McKnight, Tim McCarthy, Wanita Cooper, Joni Casey, Lori Brennan, Janalee Hogan, Donalda Kroeger, Trina Litz, and Jeri Lynn Waters. This list is actually much longer, but Becky was not here to help us get it right. She always said when she died; she would meet her good friend Lisa Analla at the Pearly Gates. A celebration of life service will be held at 10:00 a.m. Saturday, August 11, 2018, at Hood Mortuary, 1261 East Third Avenue, Durango. A reception with cash bar will be held after the service at the Veterans of Foreign Wars (VFW) Post 4031, 1550 Main Avenue in Durango.